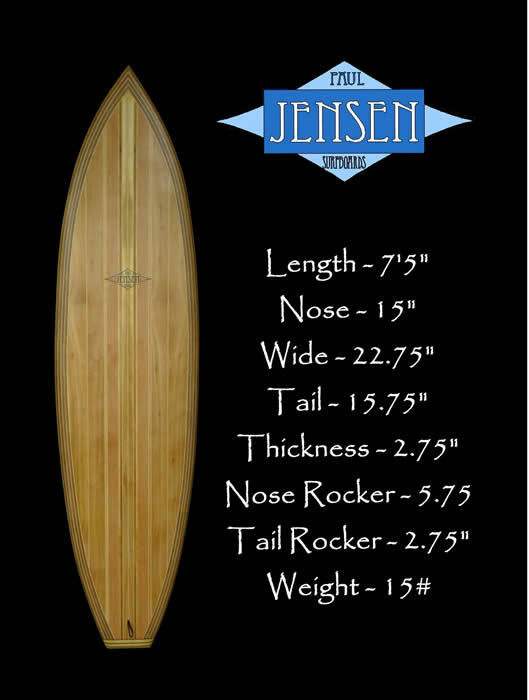 Paul Jensen Surfboards are complex. Wood and air define form and shape. 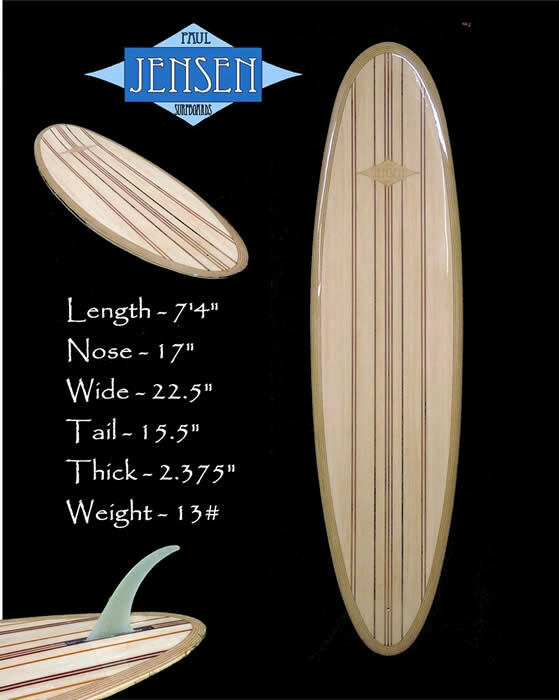 Most modern foam surfboards use fragile polyurethane foam as the core and are glassed with cheap and weak polyester resin which has a deserved reputation of breaking down too soon. 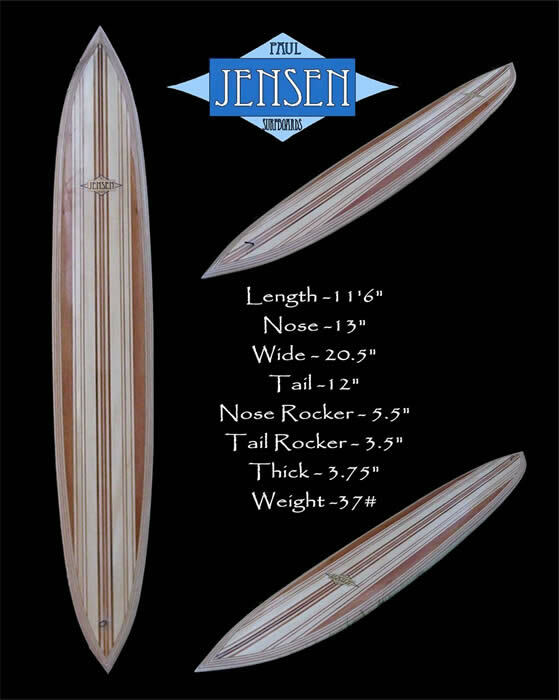 Fiberglass boards are the one-hit wonders of surfboards. They’re great for a few months, but die out after that, losing pop and gaining weight from dings. Within a year of consistent surf, if they’re not already broken, most traditional foam and fiberglass surfboards are damaged at a high replacement and environmental cost. There is a liberating freedom in the experience of leaving the modern tradition of foam and fiberglass, the known, and pursuing the critical and imaginative challenges of exploring the unknown. Using ordinary everyday "off the shelf" products, combining them with state of the art, emerging, cutting edge materials, and transforming them into exquisite functional equipment is a satisfaction seldom exceeded. The exploration of performance, form and design. My boards use only the best epoxy resin; carbon fiber and fiberglass cloths that produce engineered boards built strong and are made to be ridden everyday and last for years. 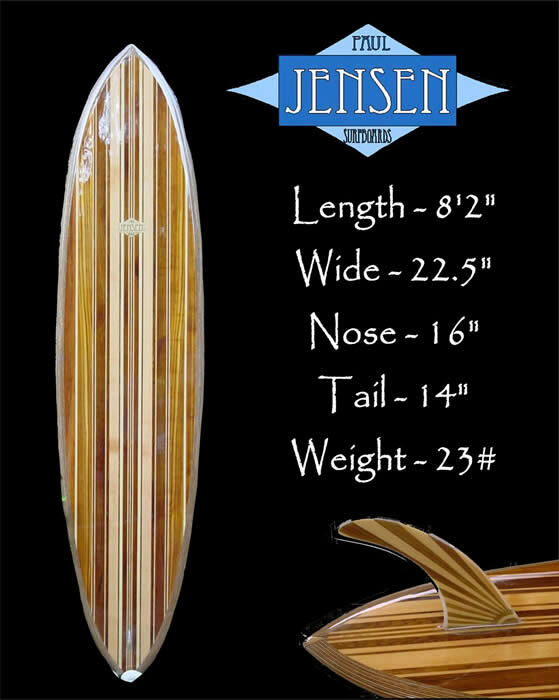 The boards I build are designed with wood and air as the core materials, then use carbon fiber cloth and epoxy resin to reinforce the interior wood structure to create a light, extremely tough inner framework. Using a palate of raw natural wood for the outer skins opens up design possibilities that are endless. The fine grain wood skins are laid into structural patterns that are also rich with visual interest. The skins are fiberglassed inside and out to create surfaces that are nearly impossible to dent. The outside rails are laminated strip by strip onto the board to give structural strength and offer flexibility when I shape the rails according to the rider’s preferences. Finally, after shaping and sanding the raw wood, the board is fiberglassed, again using the best fiberglass and epoxy resin. The epoxy I use also has superior adhesive properties that significantly reduce the chance of delamination and eliminate the surface cracking that is common on polyester foam boards. 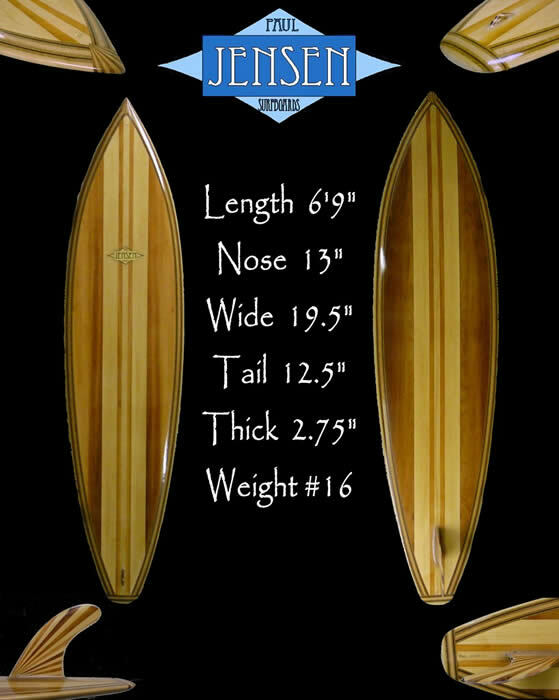 The graceful curves and linear patterns of the completed boards are enhanced with a gloss and polish finish that highlights the natural beauty of the wood. 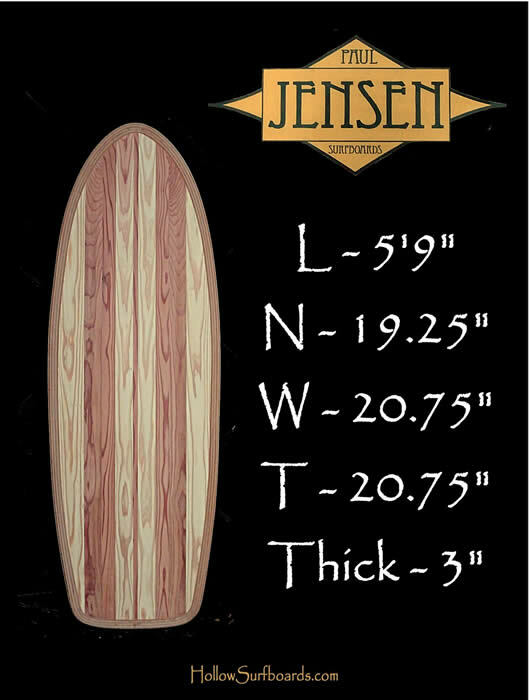 The boards at this point beg to be touched with their taut wood skins, resonant touch and smoothness under hand. 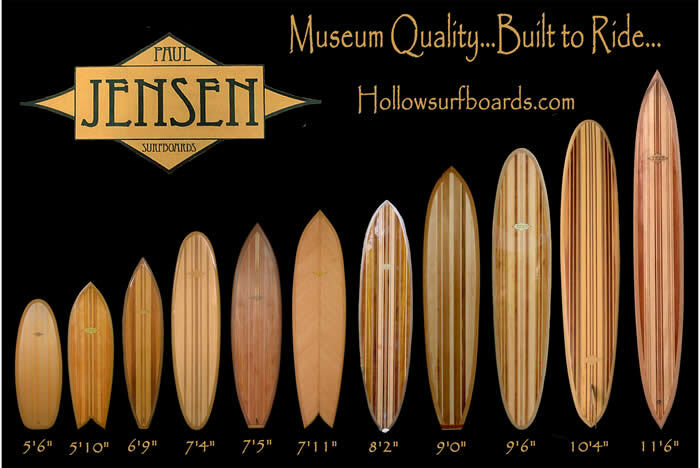 Aesthetic beauty is great, but these boards are built to be ridden. There are not intended to be wall hangers, unless the wall is 6’ of moving water. 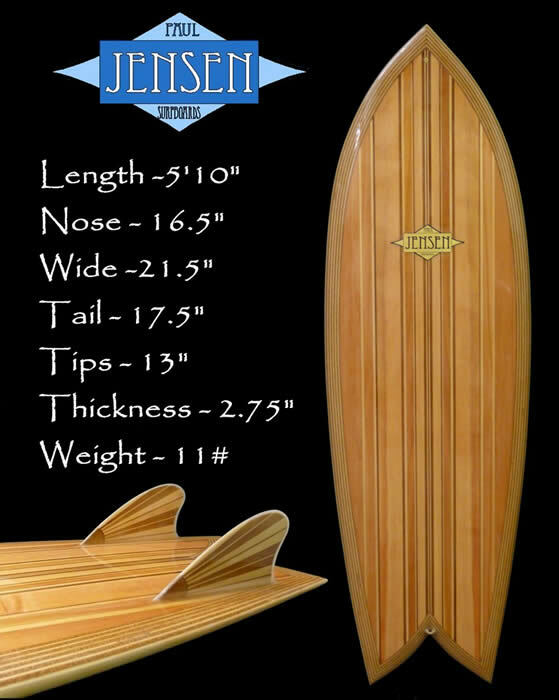 Surfing with either foam or wooden boards is a sustainable decision. As much as I can, I try to use woods that are either beach harvested or locally grown near my home in the Pacific Northwest. 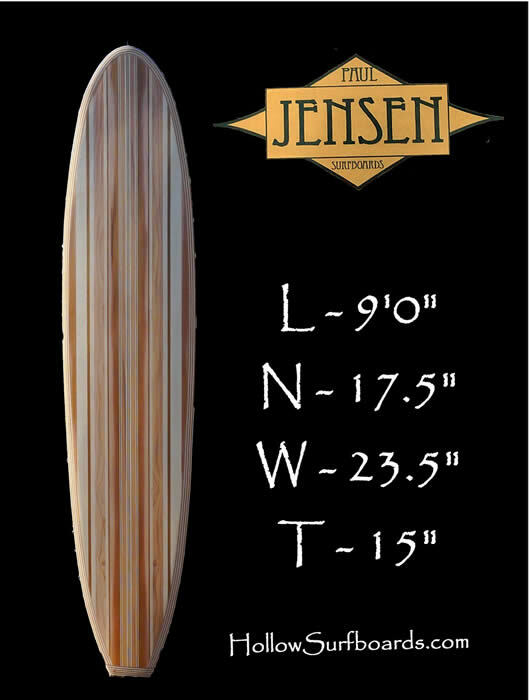 Building boards as I do, I choose to create surfboards that last a very long time using the Rolls Royce principle of building less but making them last, which ultimately uses fewer resources and reduces the need to build replacement boards. That is what ultimately makes a lower impact on our environment. We can all do better and I’m trying. 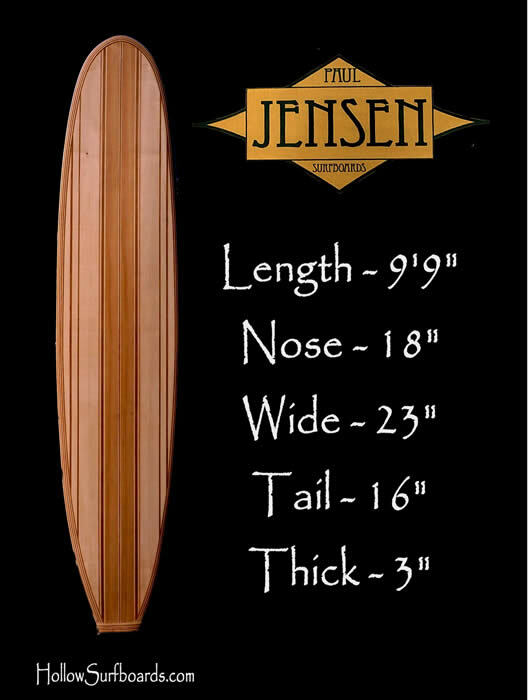 If you also consider that foam and fiberglass surfboards are likely to have only a fraction of the lifespan of a hollow wooden board, and that wood boards can last truly a lifetime, then hollow wood surfboards are more than a good value and become great investments. 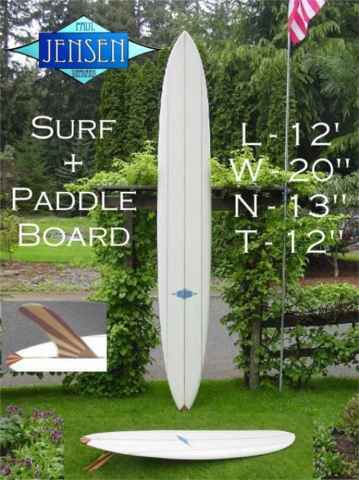 Click: Paddle/Surfboards to see more about Bigger Boards.